Some people are talented, while others get the opportunity to feature talented people. The cards I've been dealt put me in the second category, so I'm going to do the best of the situation and share my friend's great music and video here. The band, 8 Ohms Band is not active anymore, but Billy has a few other projects going on, and everyone in Baltimore is waiting for his son to master the drums and bring honor to the city. I don't know how moms travel to blogging conferences and I don't know how dads do it. I've been to the movies four times since my boy was born four years ago. Looking back, though, the Dad 2.0 Summit Doug co-founded, and which has just ended, looks like it would have been worth it. And it looks like everyone I've ever talked to on Twitter was speaking, too. Which is nice. And the Huggies people, once they realized they were not only getting themselves in trouble with parents, but actually doing that while a blogging dads' conference was happening, knew they had to fly in and make amends. Which in turn, gave the conference the extra boost of publicity that will carry it on until next year, and hopefully help it grow. 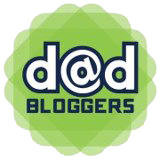 However, beyond the summits and the promotions and the sponsoring and the organizing, Doug (aka Laid-Off Dad, aka LOD) has a cool, very unassuming blog about whatever (but also about life as a single dad, sharing custody of his kids). Before blog sponsors and blog conferences, and before the irrelevant drama of Top-100-Bloggers lists on Babble, blogs like Laid-Off Dad were the reason I started reading blogs--they were our personal spaces, our own literary journals (where anything goes as long as it talks to others and as long as it's honest). Doug's focus on the blog is always the story, and always the truth, no matter how simple or how complicated it turns out to be. Why do I follow so many people on Twitter, feeling that it broadens the conversation and my experience online in general, and yet I hesitate on Facebook every time I see someone I know, thinking whether I should "friend" them or not. It's the word friend, isn't it... Such a loaded word. I talked to my wife about it and she said it was just me, so... maybe it is. And I understand some people want to separate their private-Facebook-lives from their professional lives, which are sometimes on Twitter, and I understand there are also a lot of Facebook haters on Twitter. I see people with thousands of friends, and it seems strange, but maybe it's because of that word, "friend," again. And I also see people who think following more than 100 people on Twitter doesn't make sense, while for me, if you follow 20 people on Twitter, you're doing it wrong. 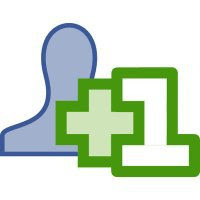 I found a few of my Twitter and blog friends on Facebook, so now I'm up to 142 Facebook friends. But why not 1000? Why not 2000? If I follow you on Twitter and you follow me, why are we not Facebook friends? Is it just the word? A month ago I requested to be friends with someone I've known on Twitter for a while, and he ignored it, so now I'm offended. I wouldn't have been offended if I followed him on Twitter and he didn't follow me back, because that's fair enough, but now on Facebook I get angry, thinking, "Oh, I'm not good enough for you?" A couple of weeks ago, I found out about the Huggies ad that has since created a giant backlash and a possible PR nightmare for Huggies. 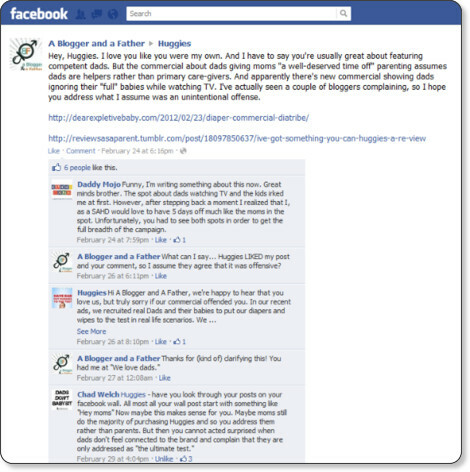 Before the backlash reached its current peak, being mentioned in the Washington Post (as well as on dozens of blogs) and forcing Huggies to apologize on its Facebook page, I left a comment on Huggies' Facebook page. My comment was answered by Huggies, and I moved on. I've been ready to move on ever since, and I'm waiting for the rest of the Internet to do the same. Hey, Huggies. I love you like you were my own. And I have to say you're usually great about featuring competent dads. But the commercial about dads giving moms "a well-deserved time off" parenting assumes dads are helpers rather than primary care-givers. And apparently there's new commercial showing dads ignoring their "full" babies while watching TV. I've actually seen a couple of bloggers complaining, so I hope you address what I assume was an unintentional offense. Hi A Blogger and A Father, we're happy to hear that you love us, but truly sorry if our commercial offended you. In our recent ads, we recruited real Dads and their babies to put our diapers and wipes to the test in real life scenarios. We love Dads. Many of us are Dads! And like you, we change diapers, wipe messes and are hands-on participants in raising kids… just like Moms. Yes, we could’ve done the Mom Test, but we wanted to celebrate fatherhood and all the fun – and challenges -- that go with it. While I understand the rage out there (and the picture on Daddy Doctrines is hilarious), and I understand where the backlash is coming from, I'm also ready to move on and accept Huggies' word that any offense was unintentional and that what we have here is a short-sighted campaign from a company that did not take into account the fact that dads were (justifiably) sensitive to the bumbling, out-of-touch-dad stereotype. They made a mistake, they acknowledged it, and we should move on. Yes, it was offensive, but was Huggies more offensive than Amazon, a company that intentionally excludes dads with their Amazon Mom program? 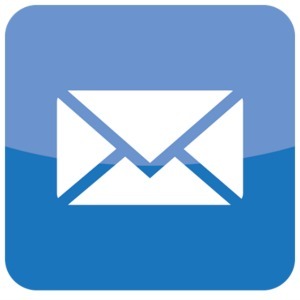 Was it more offensive than Philips AVENT, Playetx, Diapers.com, 1-800-Flowers, and more companies I've mentioned in the past because they ignored fatherhood? I may be accused of being a hypocrite here. I've been fighting the "This is no big deal" and "First-World problems" detractors for a long time, arguing that the way the mainstream media and large brands treat dads was important because it affected the way society viewed dads and the way they viewed themselves, so why am I taking the opposite view here? I'm sorry. I've complained many times about fathers not standing up together against companies, and about us not following the example set by blogging moms, whose raging voices were echoing throughout the blogosphere as one, creating real, positive change... Well, I'm sorry, but you have to count me out on this one. And I'm sorry for using the word blogosphere, by the way. But if we're willing to buy from the truly offensive Amazon because it's cheaper, and if we're willing to buy from Playtex and Philips, then we should be able to give the benefit of the doubt to a company that miscalculated the wording of its campaign, especially when that company has a history of including competent, loving dads in its ads. And now if you'll excuse me, I'll go watch that "Little Movers" video again. But then I saw this box. Located among all the heroes. 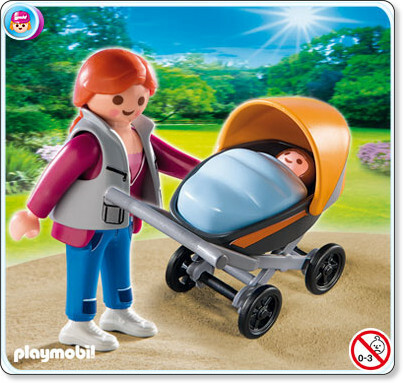 A Playmobil Dad? Wait, what else does he do? Does he slay dragons and save princesses? Does he search for treasures buried in lost islands? Does he tame wild horses, at least? 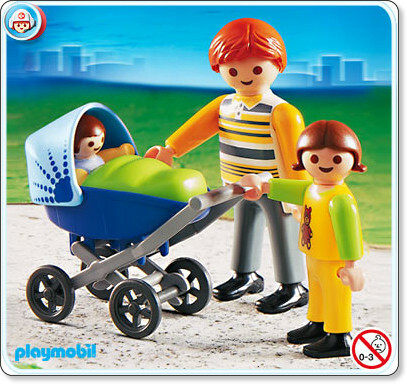 Respect, Playmobil! After chasing and writing about so many companies that have no idea what to do with dads, it was actually shocking to see a company portraying a dad simply being a dad. And... Well, if I may... Hello there, Playmobil Mom!